Knowledge of horse behavior pattern is essential for any person dealing with horses. 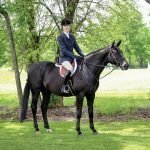 Knowing how a horse can be expected to react under certain circumstances may often make the difference between success and failure when educating or competing on the horses. Horse behavior study may also make the difference between safe handling and potential injury to either the horse or the horseback rider. The horse’s brain is very small for its size and horse behavior is governed by instinct rather than reasons. From it evolved, the horse has been the hunted, rather than the hunter and its survival depended on the ability to sense and run from the danger. This instinct explains the horse’s strung, excitable nature. 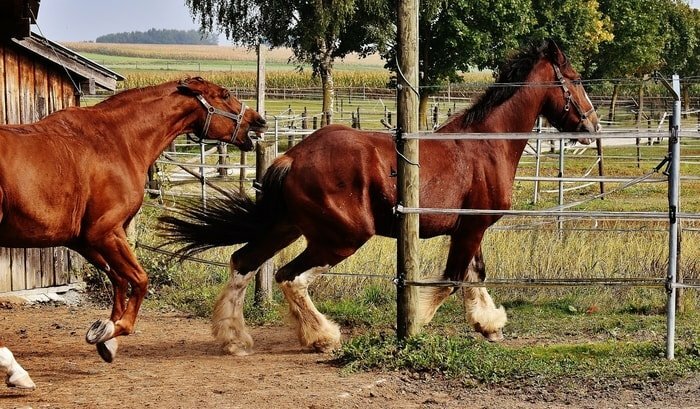 If a horse cannot run in a situation which it feels is potentially dangerous, its next line of defense is to kick or bite, and this reaction must be accepted as a possibility of a young horse. As the horse gets older, however, and become more used to riders and handlers, these reactions are unacceptable and become known as vices. 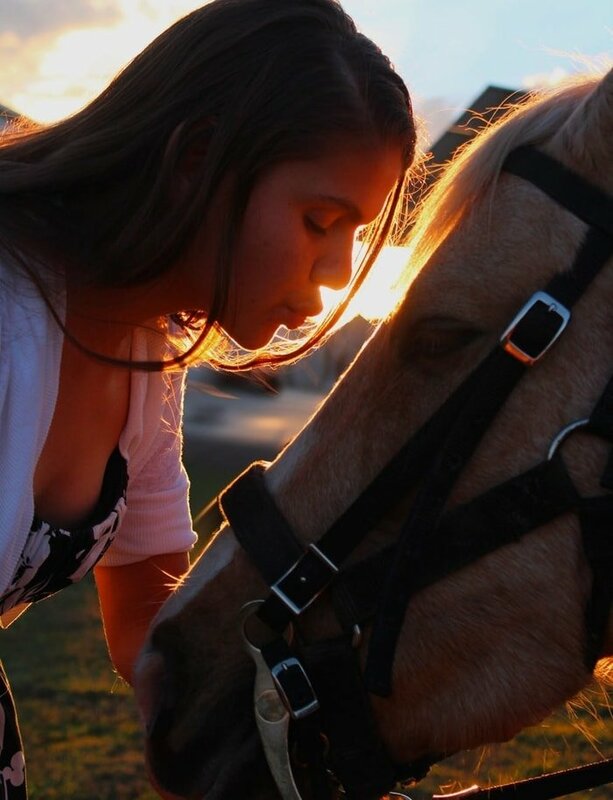 The horses have developed a variety of characteristics that have a strong influence on its temperament and behavior. 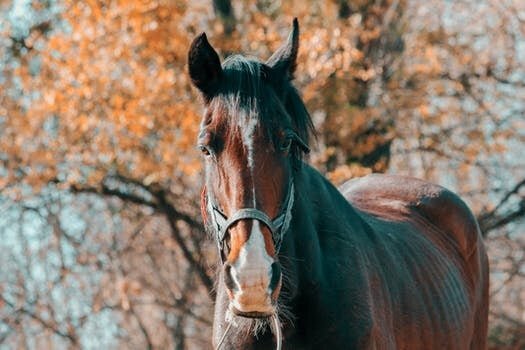 Many of these characteristics have developed as a direct result of the horse’s need to survive in an environment where the early detection of danger is paramount. The size and position of the eyes and the width of the head and the body determined the horse’s field of vision. The eyes, set wide apart on either side of the head, give a good deal of sideways vision. In the wild, this provides a useful early warning system for horses. It also means that a domesticated horse may shy at something glimpsed out of the corner of its eye when the rider least expects it and understanding of horse behavior depends on its many aspects. Despite good sideways vision, a blind spot is found in front and behind of the forehead of a horse. It is thought that horses are color blind and they are unable to differentialr separate objects like rabbit and mice. They conceive movements instantly, however, and will react according to their temperament. Horses are considered to have memories second only to elephants, so a well-trained horse never forgets its training, nor does a badly trained one. Because of this, bad horse behavior needs to be recognized and corrected early if later problems are to be avoided. Unlike humans, horses can nor rationalized but learn from experience. They tend to repeat behavior which brings a favorable response and avoid behavior which evokes a response from the rider or handler. Horses learn through a system of repetition, reward, and correction. 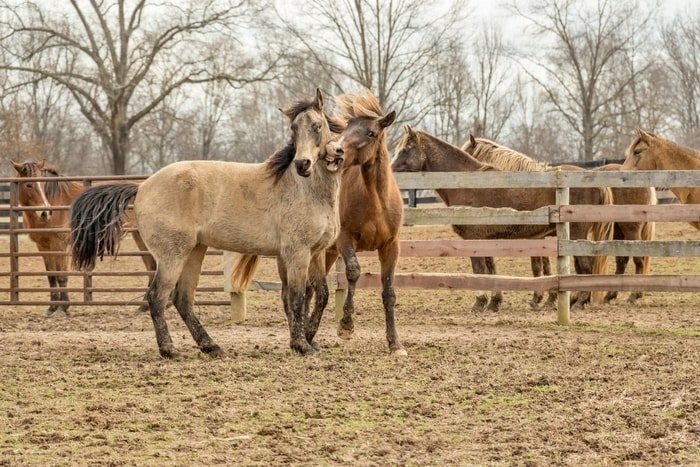 Remember that because they have no reasoning power, horses are unable to connect a reward or correction given several minutes after an action. If a rider or handler quick to reward a job well done with an encouraging word or a pat, the horse will associate that action with an enjoyable sensation and be all the more ready to perform properly next time. By the same token, if it is necessary to correct the horse, correction must follow the action immediately so that it is clear to the horse what the rider is punishing it for. The horse has a relatively short attention span, and all educational work should be restricted to a set period suitable to the individual horse’s age and level of education. The horse’s senses of hearing and smell are both well developed, enabling the horse to be aware of subtle differences in its environment. Many horses become unsettled on windy days, probably because they can not hear or smell as well with the rush of the wind passed ears and nostrils. They cannot pick up all the usual sounds and smells, and they can hear and smell many things that are unfamiliar. Their acute hearing means that horses can also be upset by sudden or loud noises like the bang of a door or a tin can rattling in a gutter. Some loud noises may even be painful to the horse, and continual exposure to them can result in deafness. On the other hand, because relies heavily on its sense of hearing, a horse will respond well to a gentle, calm tone of voice. 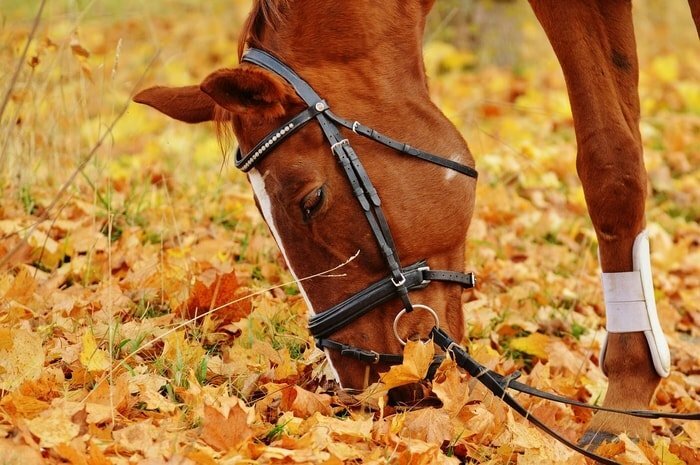 Horse behavior signs depend on the hearing and smelling power of your horse. Skin sensitivity is highly developed in horses, enabling them to detect such things as flies landing on their hide, heat, cold and pain. The most sensitive areas are the mouth, feet, legs, flank, neck, and shoulders. Some horses are more sensitive than others, and when grooming this parts of the horse, care must be exercised. Sensitive skin horses are more prone to bad behavior. The herd instinct is another inheritance from the horse’s wild ancestors. Being the others of its own kind give the horse a sense of security. In a herd situation, each horse has its place in the social hierarchy, so on a horse will be the boss of the group and every other member of the group will bully another. This has implications for horse handlers to understand horse behavior. Adding new horses to a group will the upset the pecking other temporarily so horses must be watched carefully during this times to ensure that they do not injure each other. They must also be watched during confinement in a small yard and at feeding time as these are situations when dominant horses reinforce superiority. The herd instinct is combined with a strong instinct for submission. In the wild, a herd has a single leader who exerts authority over the rest. It is this instinct which gives the horse a natural tendency to look for leadership and to accept the dominance of the handler, provided that person exerts the necessary dominance and calm. Should a rider let the horse feel that it is dominant, the rider will have a great deal of difficulty making the horse do what it is told. Their herd experience means that horses are quick to sense fear or hesitation, both in other horses and humans. The ears pick up the slightest tremor in the voice, and the nose picks up the smell of fear. Even a placid animal can react adversely if they sense their rider is nervous and uncertain. Most mares show a distinctive change in behavior during heat or periods when they are receptive to the stallion. They tend to leave their mates, grace intermittently and are much more restless than usual. When looking for behavioral science to determined heat, remember that changes are relative to each normal horse behavior. So look for the changing behavior. For intense a normally aggressive mare may become timid or submissive when teased, while a timid mare may show signs of aggression. Normal mares will also show a combination of signs associated with heat, including winking, approaching the stallion, squatting, lifting the tail, urination, and submission. Breeding often takes place while a foal is at the foot, and mares have a strong maternal attachment. Even being while served mares will become agitated or excited if they cannot see their foals. Keep the foal nearby and in view during the actual service to encourage the mare to stand as quietly as possible. A stallion does not behave in the same way as the other horses. Stallion’s hormones and instinct create vast differences. Stallions even defecate and urinate in a different manner from mares and geldings. They back up to the dung heap with legs apart to defecate, so that the dung is placed in a net amount. They also in the same spot in each time. A stallion is a social animal like any other horse. He likes company and can become bored, and consequently unmanageable, without contact with other horses. The behavior of stallion leveled uncontrollable, nasty, vicious or mean, more often than not due to the restrictions handlers placed upon them. Always handle a stallion with the utmost respect and be prepared for unpredictable behavior. 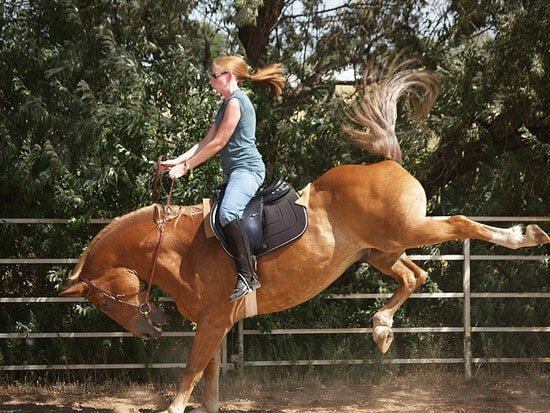 Any observant rider or handler should be able to identify the outward signs of a horse behavior mode. The ears are often a good barometer, ears upright and alert show a receptive frame of mind: ears flicking back and forwards means uncertainty, and ears laid back, the accompanied by the swish of the tail indicate bad-tempered and possible will to kick. Signs of nervousness of rolling or showing the whites of the eyes, snorting, tossing of the head or sidling along. A horse that is likely to Shy at an unfamiliar object will probably tense and start flicking its ears. If these signs are interpreted correctly, the rider can act to forestall problems. The nervous horse can be calmed, the horse that is about to shy can be given encouragement and reassurance with voice and a firm set, and the potential kick of the bad-tempered horse can be avoided. 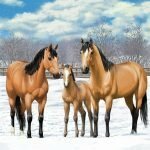 I thought that you got a clear idea about horse behavior from the above article. If you are a horse owner and caregiver, you must understand the mind of your horse properly. If you are enriched on your horse mind by reading the article, please share with your friend.